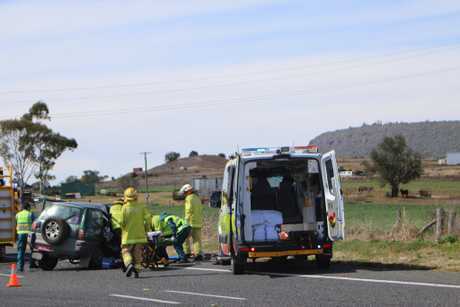 UPDATE 5.45PM: THE 50-year-old woman injured in a crash on the Cunningham Hwy has died. Queensland Police issued a statement this afternoon confirming the woman died after being transported to Warwick Hospital in a serious condition. Initial reports from QAS said the woman was 60 years old and had sustained serious bleeding. Police have now called for witnesses to come forward as they investigate the circumstances of the crash. 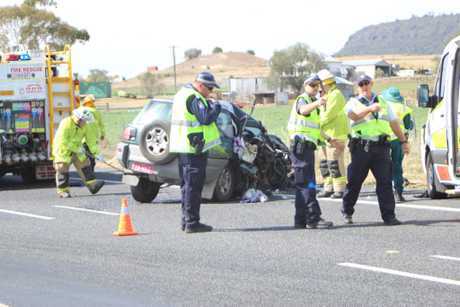 "Initial investigations indicate just prior to 12 noon, a Toyota Rav4 heading west on the Cunningham Highway approximately 15km east of Warwick collided head-on with a truck travelling in the opposite direction," the statement said. Police are also seeking dashcam footage of the crash. The male driver of an LPG gas tanker was not injured. UPDATE, 1.30pm: A WOMAN who was trapped in her vehicle on the Cunningham may be airlifted for her injuries. 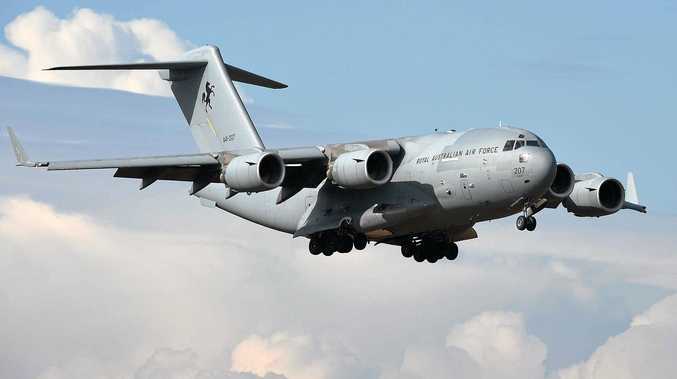 A QAS spokeswoman said initial reports indicated the woman in her 60s had serious bleeding but could not disclose further details of her injuries. The woman has now been transported by ambulance and a LifeFlight helicopter is waiting her arrival at Warwick Hospital to airlift her depending on the severity of her injuries. A spokesman for Queensland Police Media said no charges had been laid at this point. EARLIER, 12.30pm: A WOMAN is trapped in a car with serious bleeding following a collision on the Cunningham Hwy this afternoon. Emergency Services are working to free the woman after her vehicle and a LPG gas tanker collided at Clintonvale just after midday. The woman's age is currently unknown but paramedics are treating her on scene under the assumption of serious spinal injuries. Several passersby have stopped to assist first responders and help police control traffic. The incident has blocked the south bound lane of the highway and drivers are urged to approach with caution.